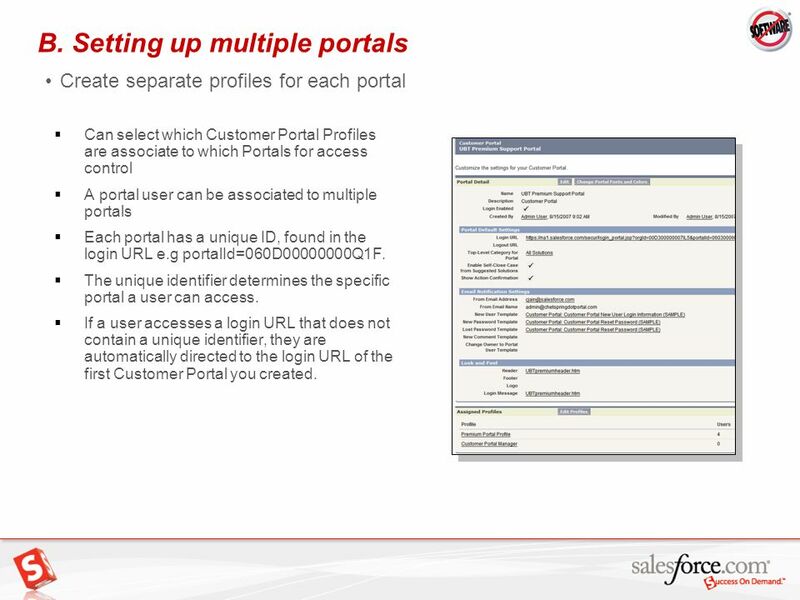 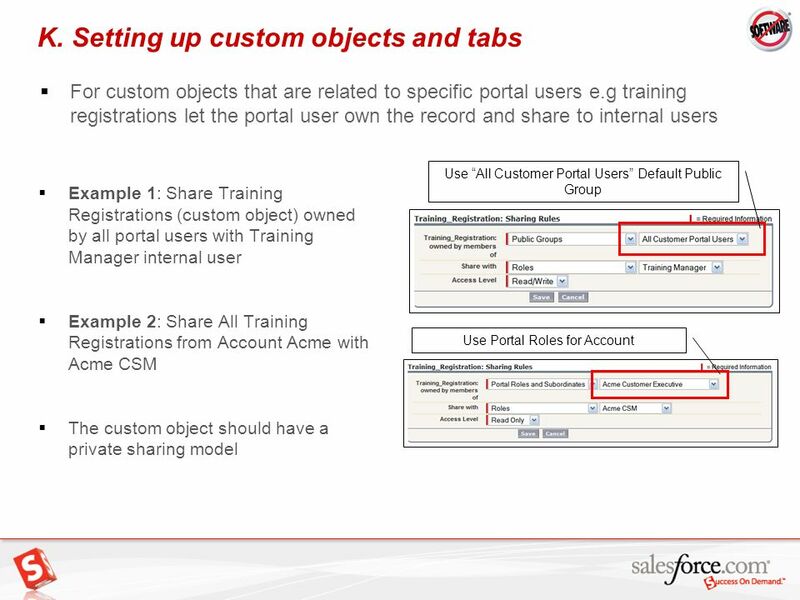 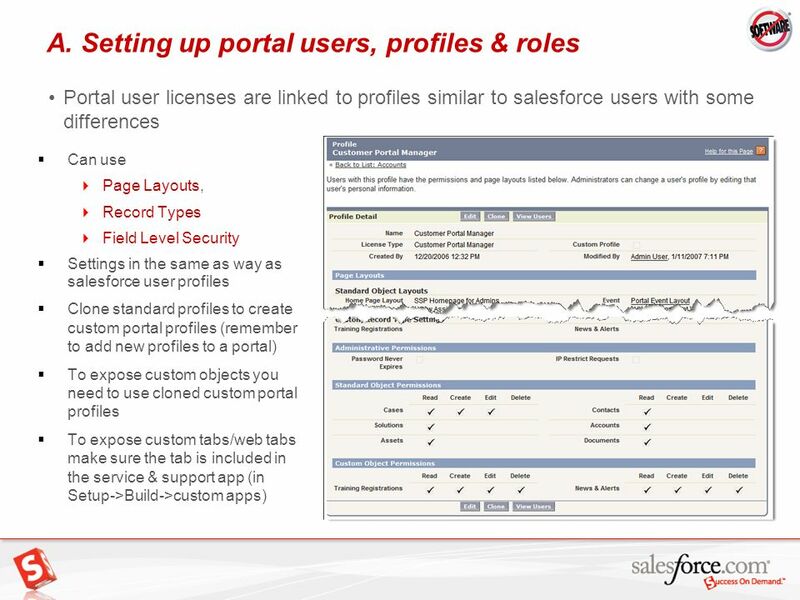 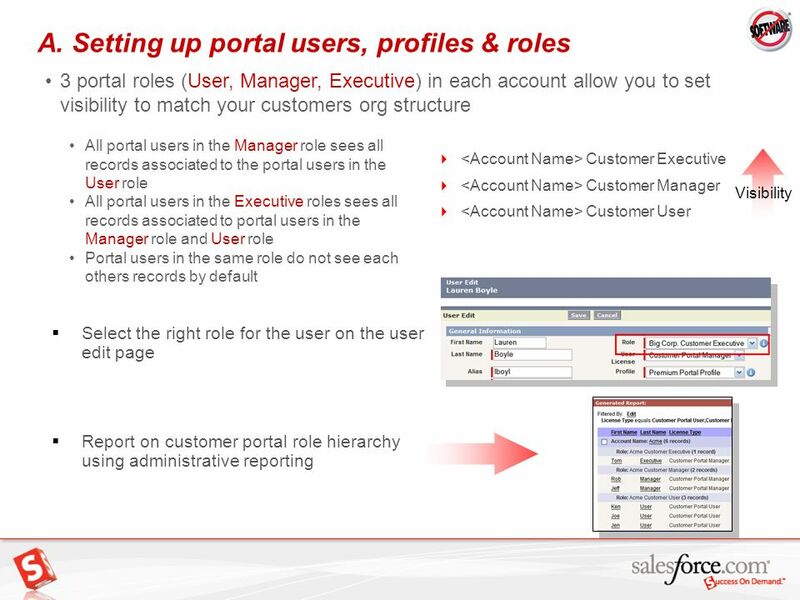 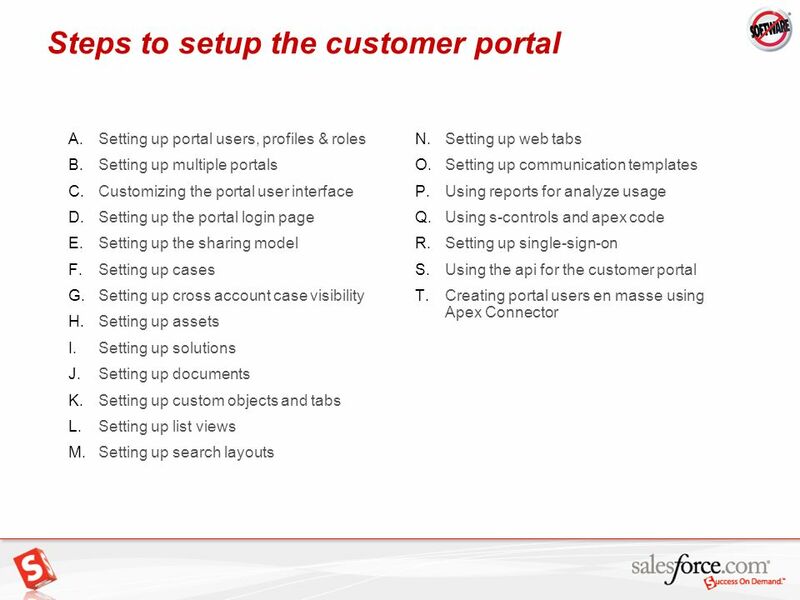 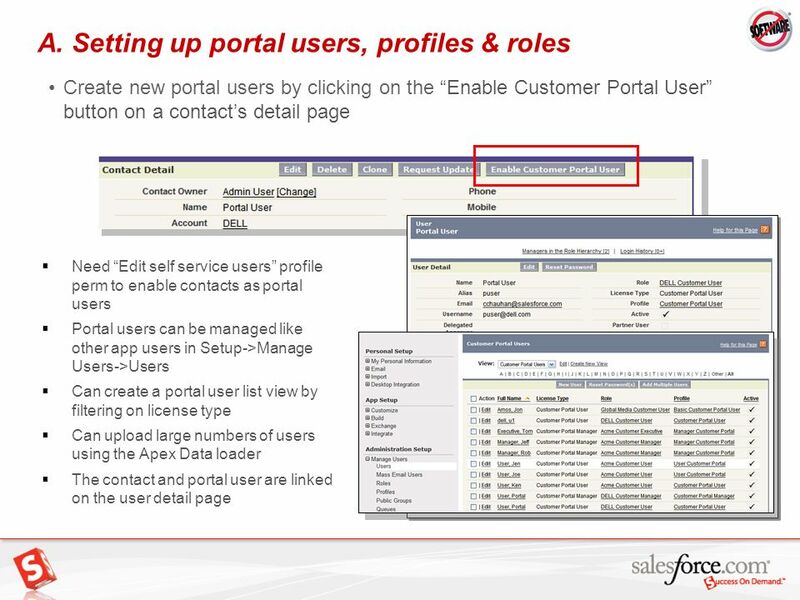 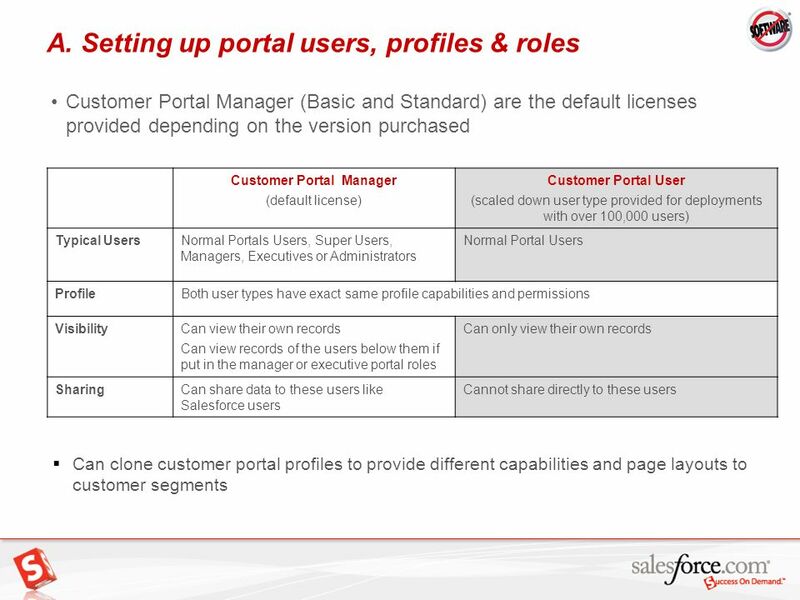 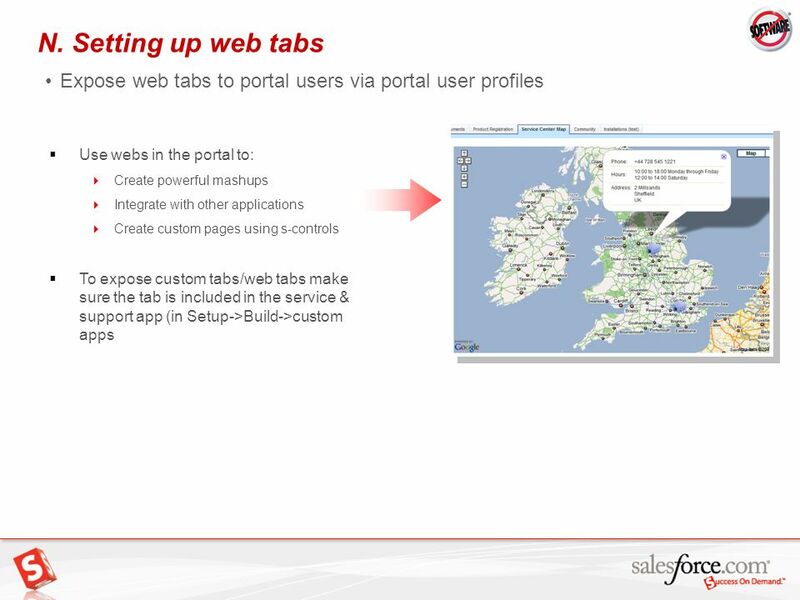 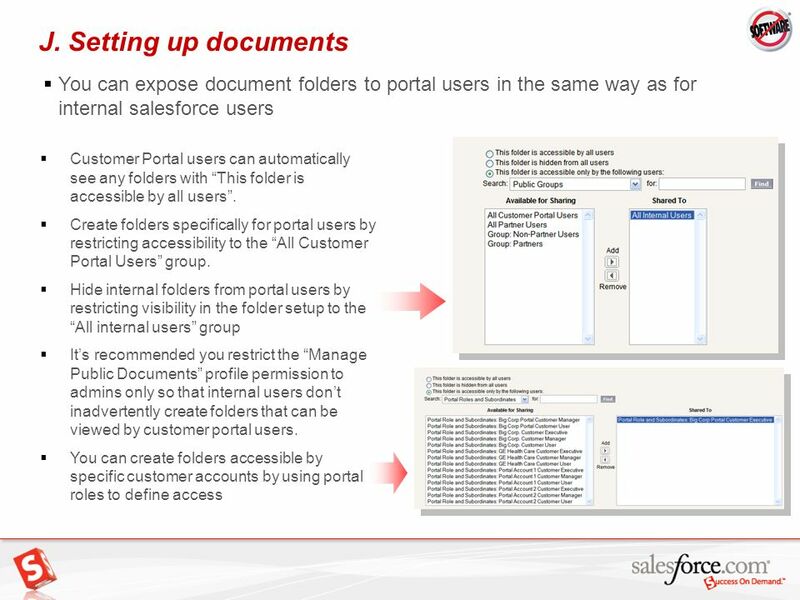 Create separate profiles for each portal Can select which Customer Portal Profiles are associate to which Portals for access control A portal user can be associated to multiple portals Each portal has a unique ID, found in the login URL e.g portalId=060D Q1F. 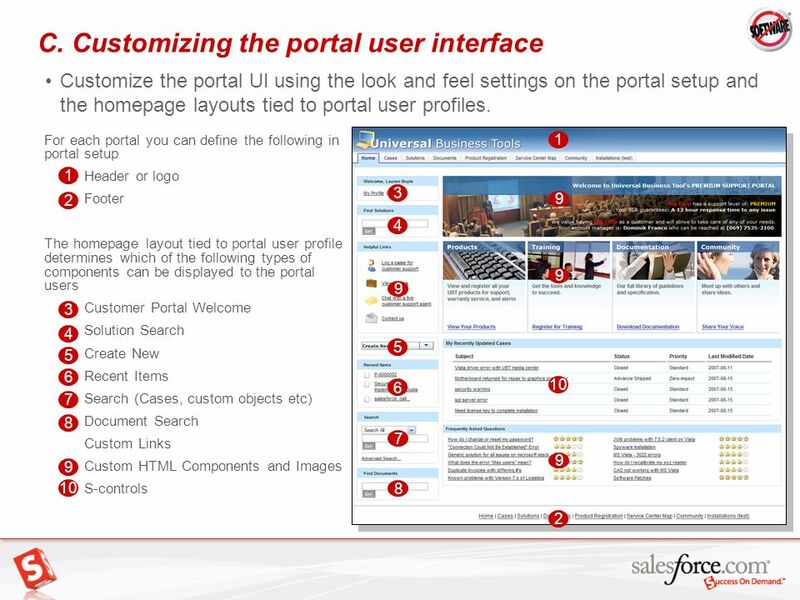 The unique identifier determines the specific portal a user can access. 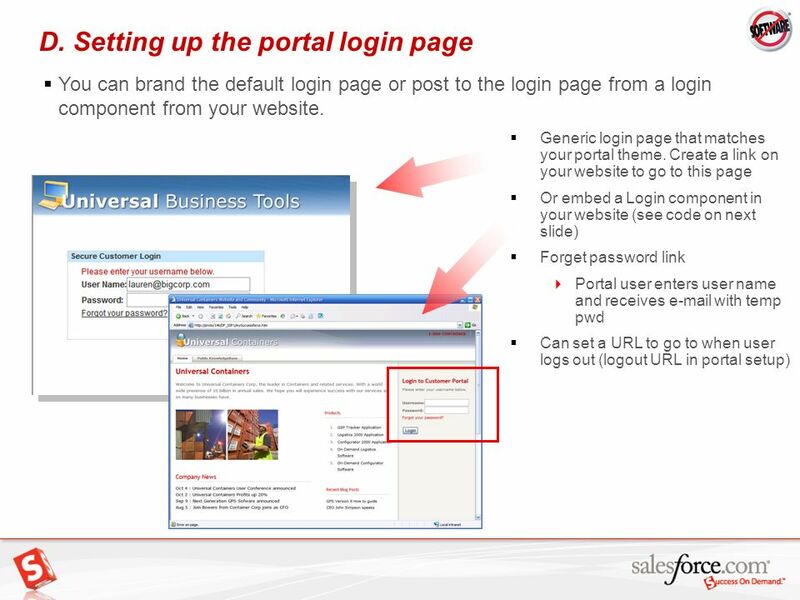 If a user accesses a login URL that does not contain a unique identifier, they are automatically directed to the login URL of the first Customer Portal you created. 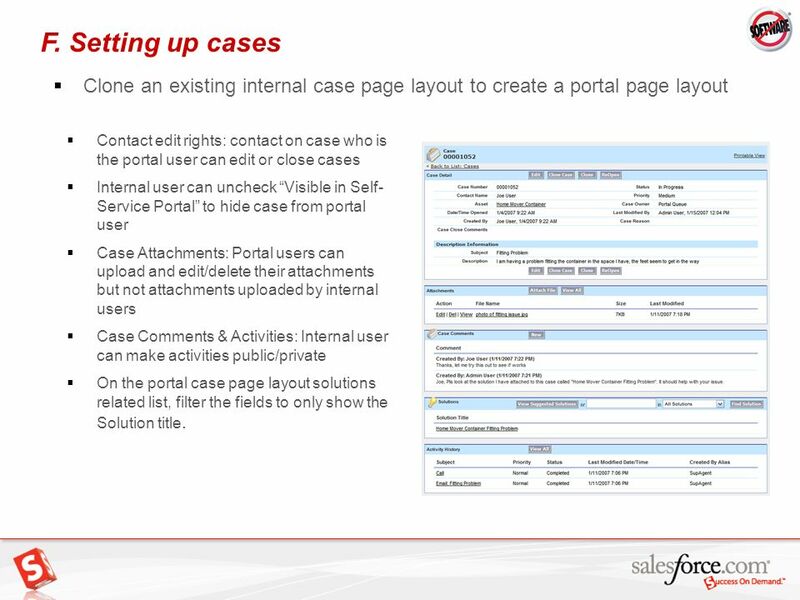 20 F. Setting up cases Clone an existing internal case page layout to create a portal page layout Contact edit rights: contact on case who is the portal user can edit or close cases Internal user can uncheck “Visible in Self-Service Portal” to hide case from portal user Case Attachments: Portal users can upload and edit/delete their attachments but not attachments uploaded by internal users Case Comments & Activities: Internal user can make activities public/private On the portal case page layout solutions related list, filter the fields to only show the Solution title. 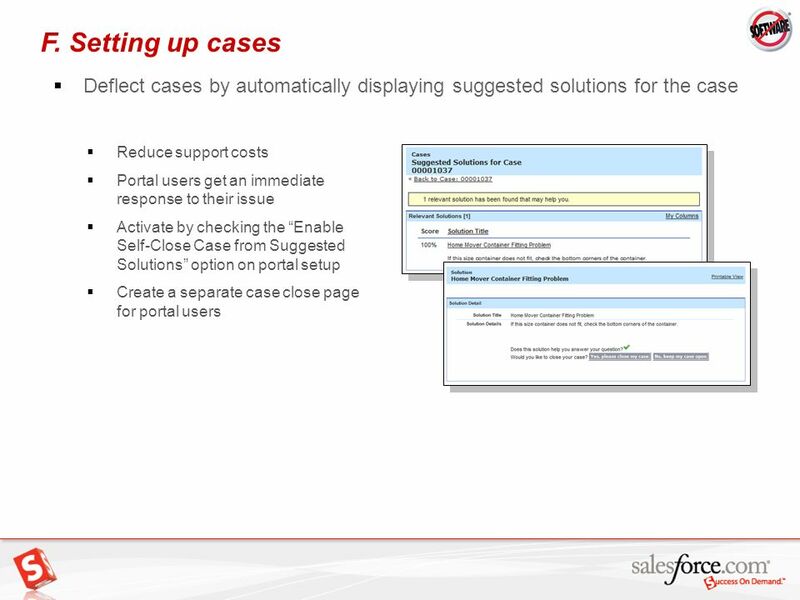 22 F. Setting up cases Changing case ownership using case assignment rules If using case assignment rules it is recommended you set up an additional record type and page layout which you change to your normal record type using workflow after the case is created (this will prevent cases from being reassigned when they are edited by portal users) Step 1: Create a “new portal case” record type with a corresponding case page layout that has the “Select Case Assignment checkbox by default” checked. 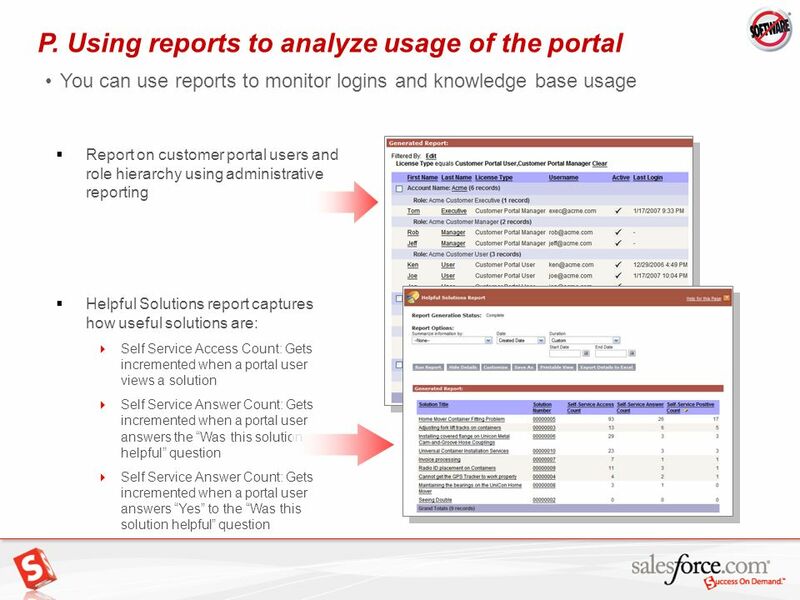 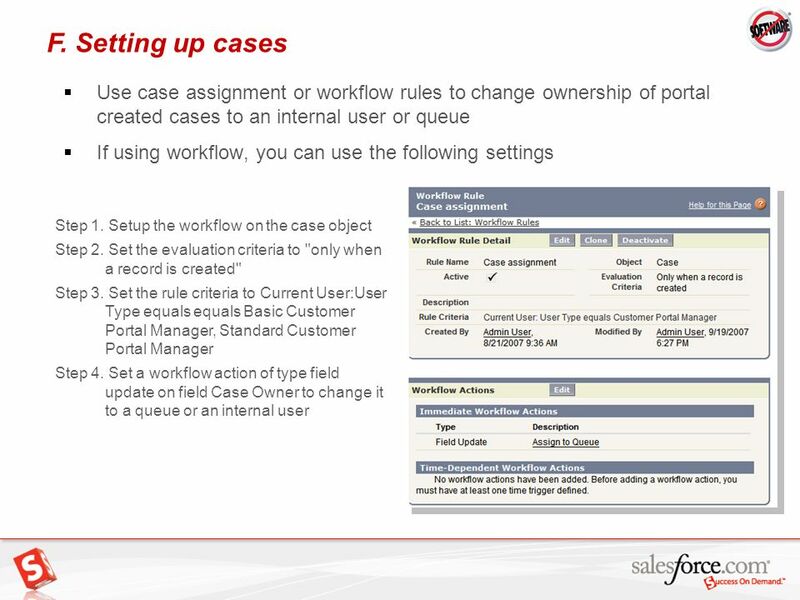 Step 2: Ensure that this "new portal case" is the case record type selected on the portal user profiles (and only this record type is selected) Step 3: Create a workflow rule that changes the “new portal case” record type to your normal record type when a new case is created by a portal user in the following way a) Setup the workflow on the case object b) Set the evaluation criteria to "only when a record is created" c) Set the rule criteria to Current User:User Type equals Basic Customer Portal Manager, Standard Customer Portal Manager d) Set a workflow action of type field update on field Case Record Type to change it to your normal record type Step 4. 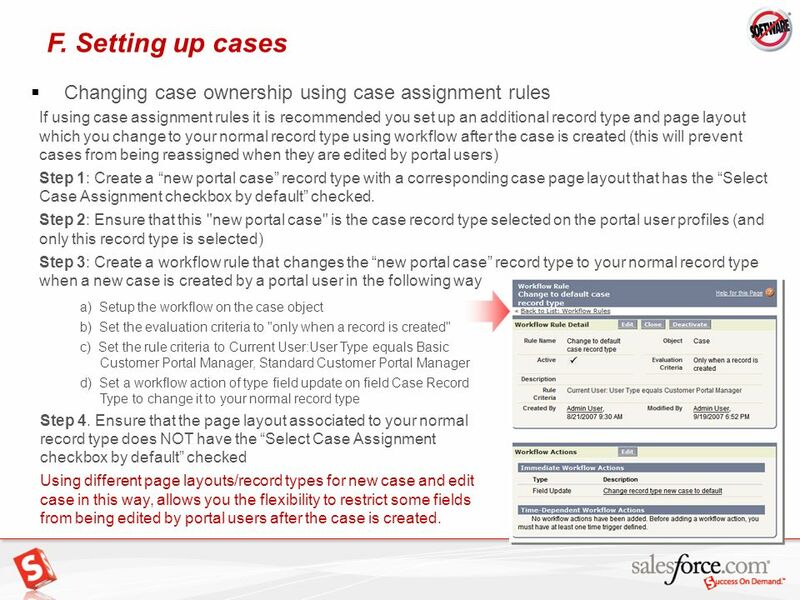 Ensure that the page layout associated to your normal record type does NOT have the “Select Case Assignment checkbox by default” checked Using different page layouts/record types for new case and edit case in this way, allows you the flexibility to restrict some fields from being edited by portal users after the case is created. 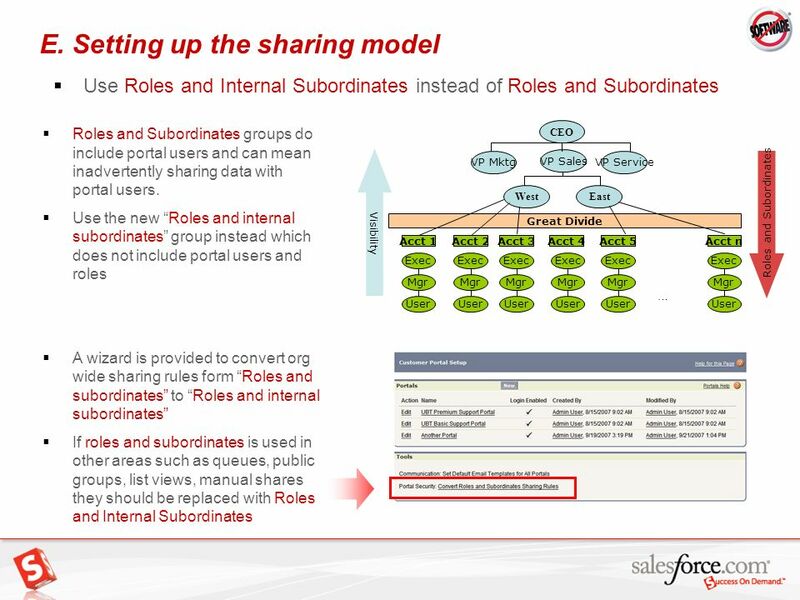 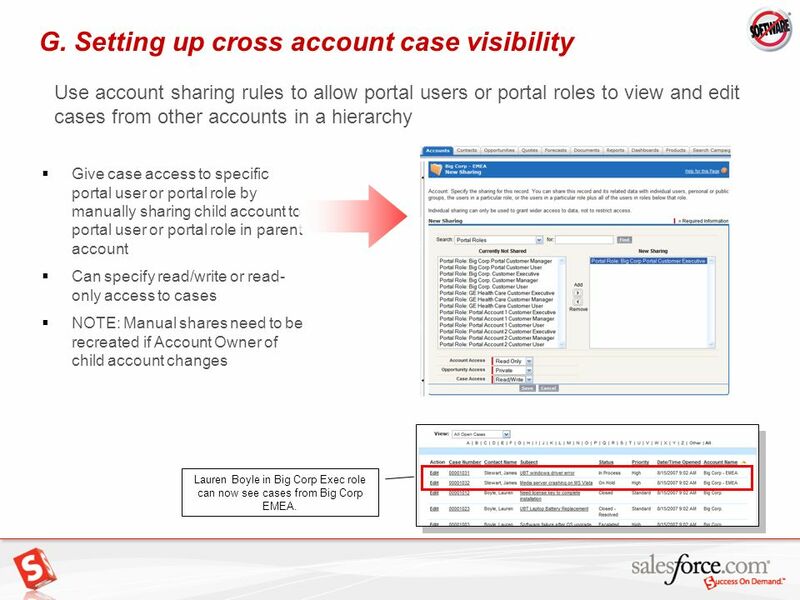 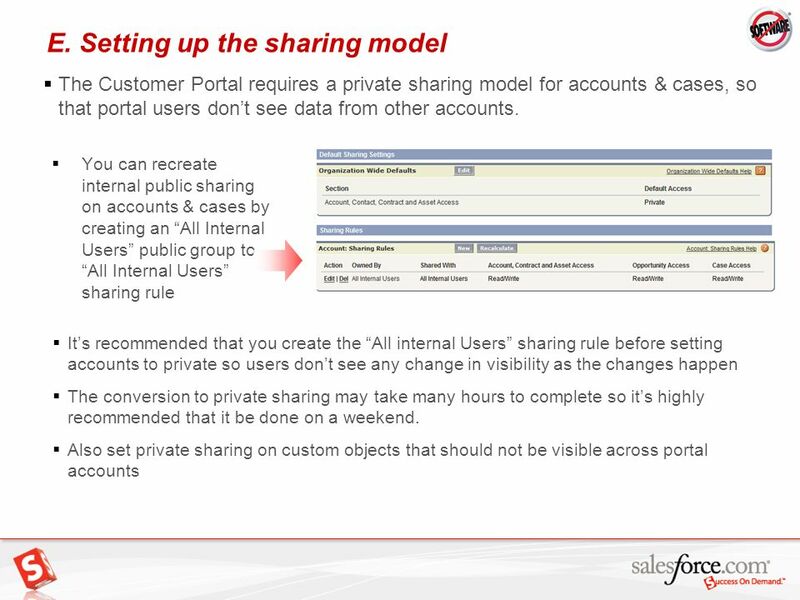 Use account sharing rules to allow portal users or portal roles to view and edit cases from other accounts in a hierarchy Give case access to specific portal user or portal role by manually sharing child account to portal user or portal role in parent account Can specify read/write or read-only access to cases NOTE: Manual shares need to be recreated if Account Owner of child account changes Lauren Boyle in Big Corp Exec role can now see cases from Big Corp EMEA. 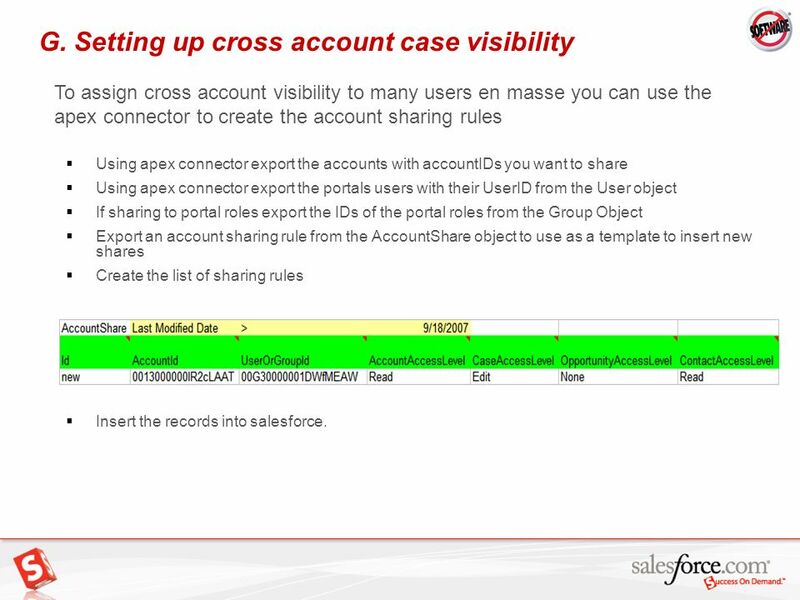 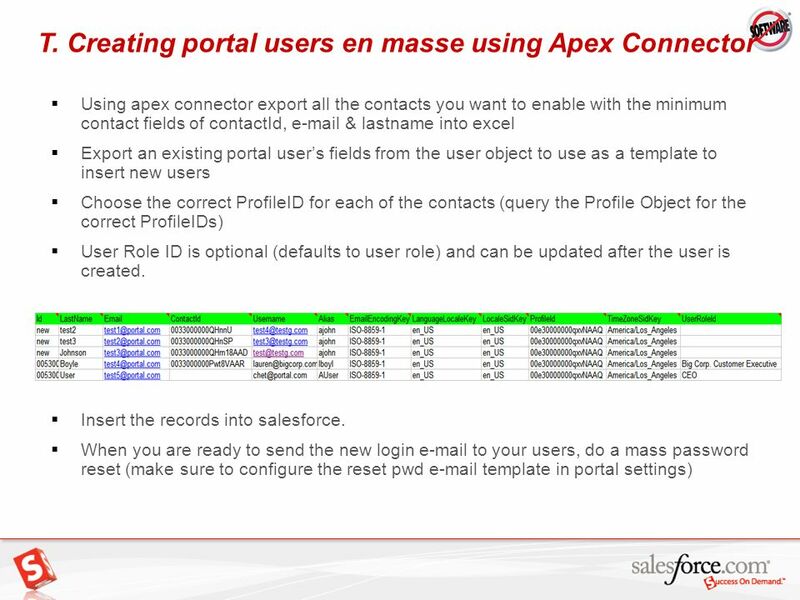 To assign cross account visibility to many users en masse you can use the apex connector to create the account sharing rules Using apex connector export the accounts with accountIDs you want to share Using apex connector export the portals users with their UserID from the User object If sharing to portal roles export the IDs of the portal roles from the Group Object Export an account sharing rule from the AccountShare object to use as a template to insert new shares Create the list of sharing rules Insert the records into salesforce. 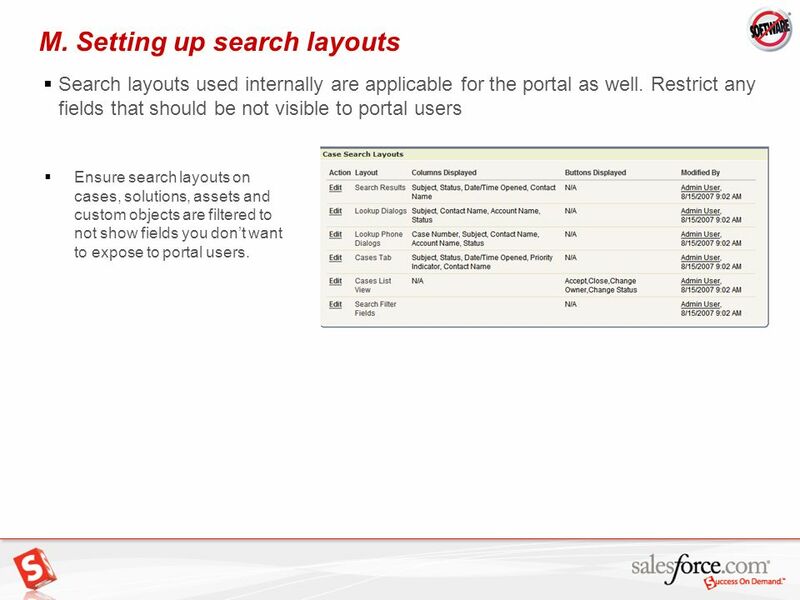 Search layouts used internally are applicable for the portal as well. 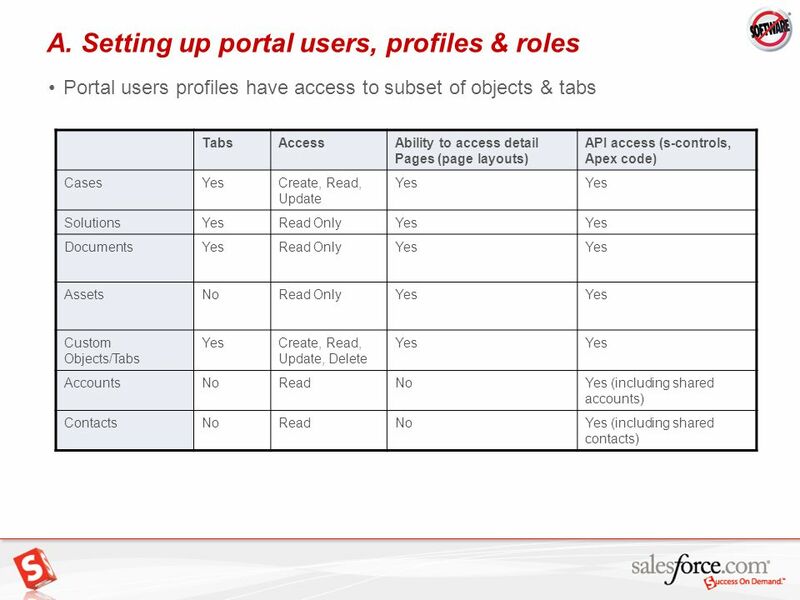 Restrict any fields that should be not visible to portal users Ensure search layouts on cases, solutions, assets and custom objects are filtered to not show fields you don’t want to expose to portal users. 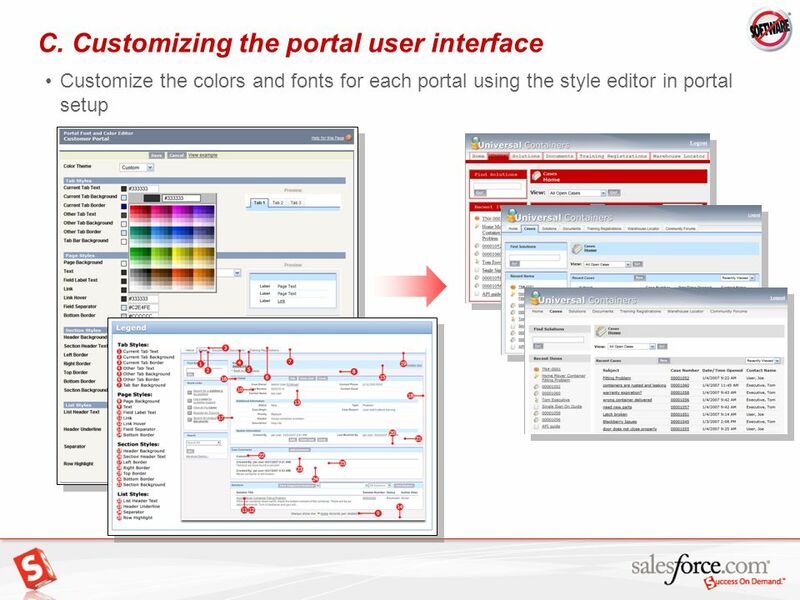 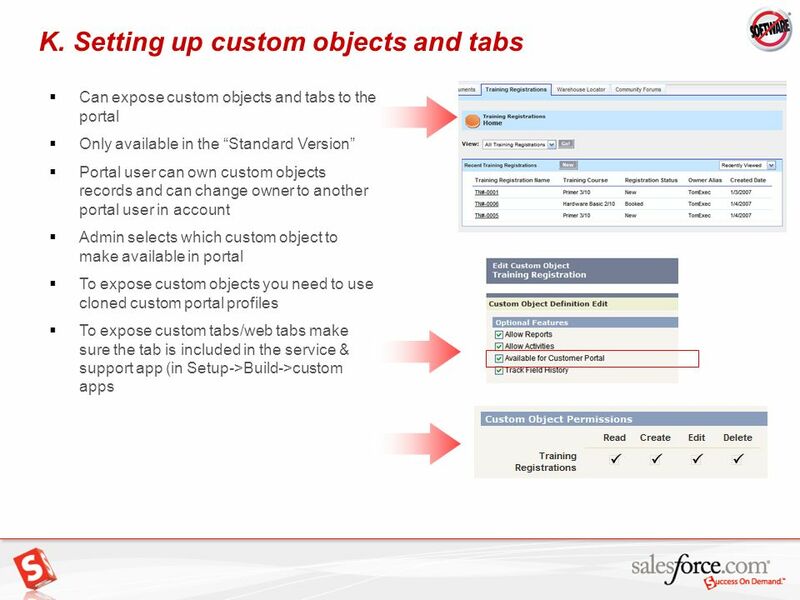 You can create branded templates for when portal users are sent s The following templates are available in portal setup and can be configured differently for each portal. 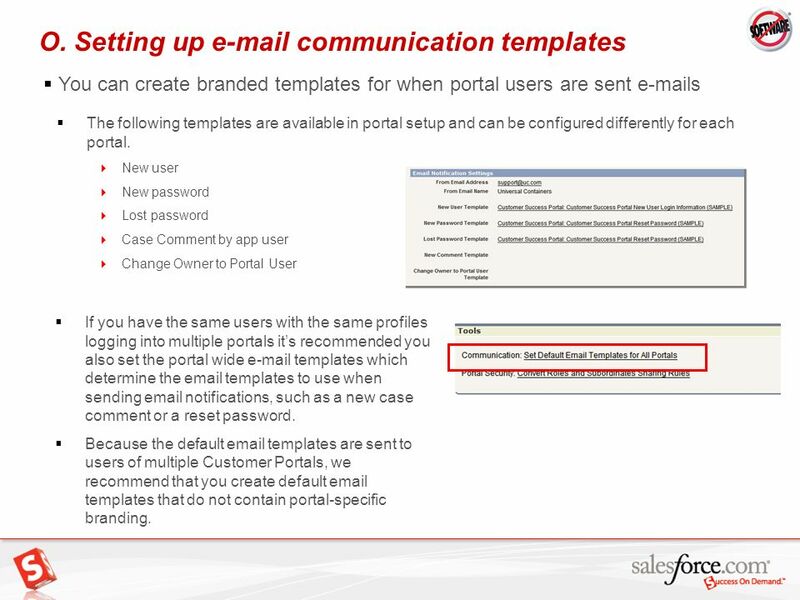 New user New password Lost password Case Comment by app user Change Owner to Portal User If you have the same users with the same profiles logging into multiple portals it’s recommended you also set the portal wide templates which determine the templates to use when sending notifications, such as a new case comment or a reset password. 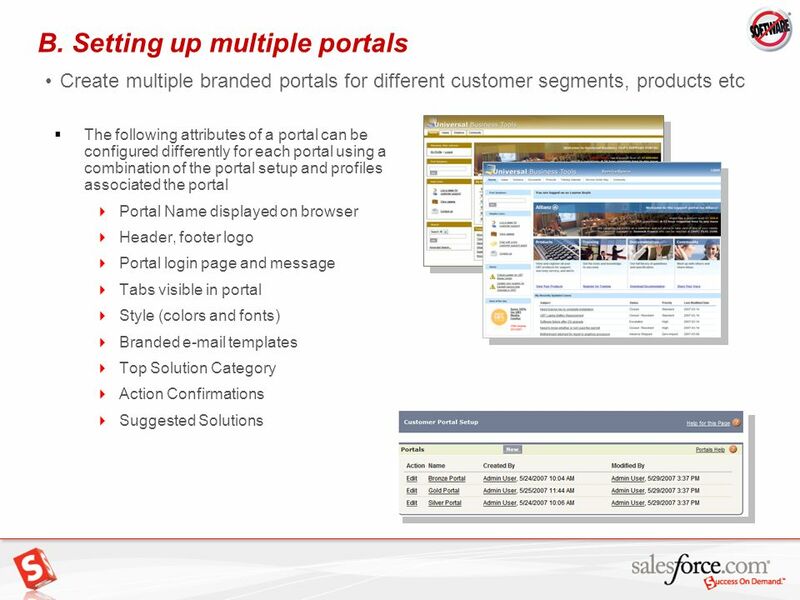 Because the default templates are sent to users of multiple Customer Portals, we recommend that you create default templates that do not contain portal-specific branding. 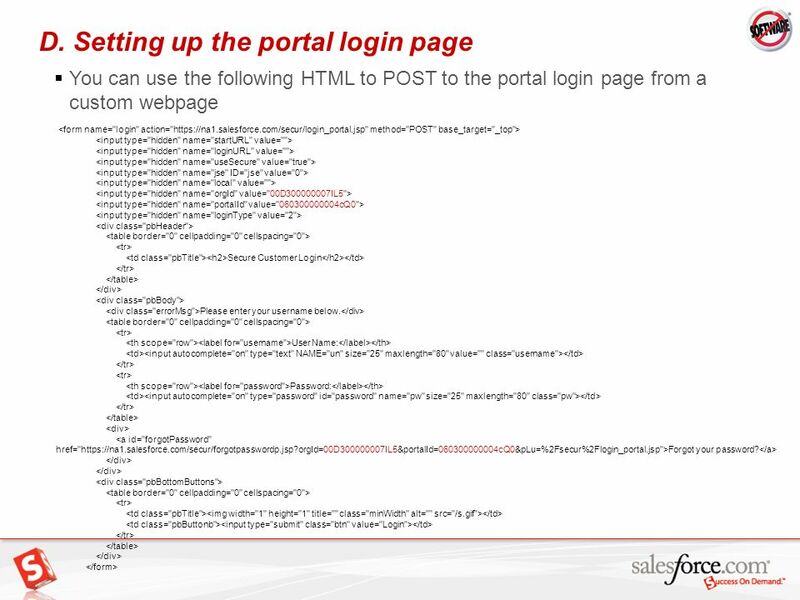 You can use S-controls and Apex Code to customize the portal Use the portal stylesheet in your s-controls by specifying the correct OrgID and PortalID “/sCSS/9.0/PortalDefault/<ORGID>/<PORTALID>/portal.css” Embed S-controls on portal homepage by creating an HTML homepage component that refers to the S-control in an IFRAME. 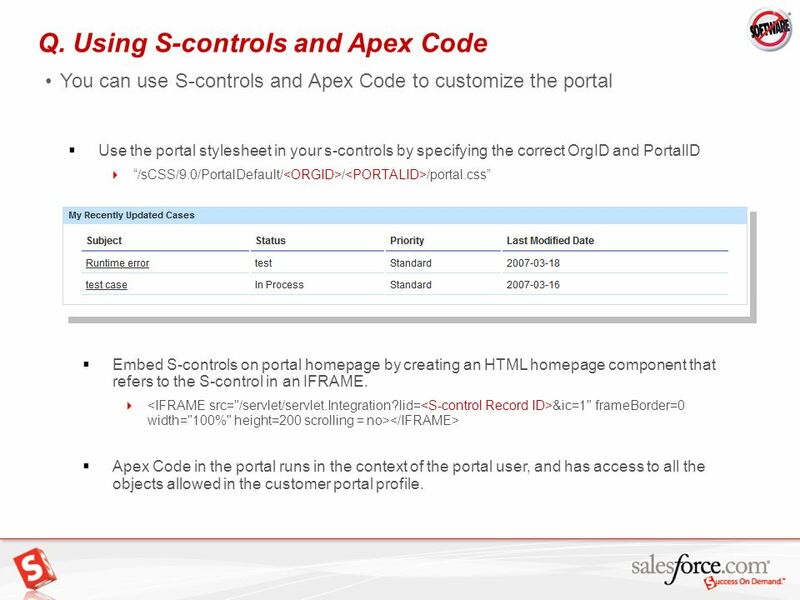 <IFRAME src="/servlet/servlet.Integration?lid=<S-control Record ID>&ic=1" frameBorder=0 width="100%" height=200 scrolling = no></IFRAME> Apex Code in the portal runs in the context of the portal user, and has access to all the objects allowed in the customer portal profile. 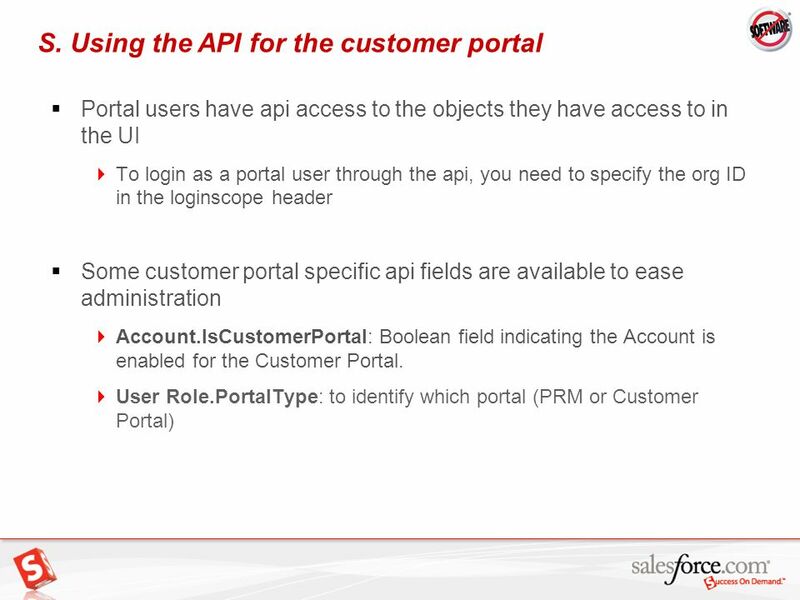 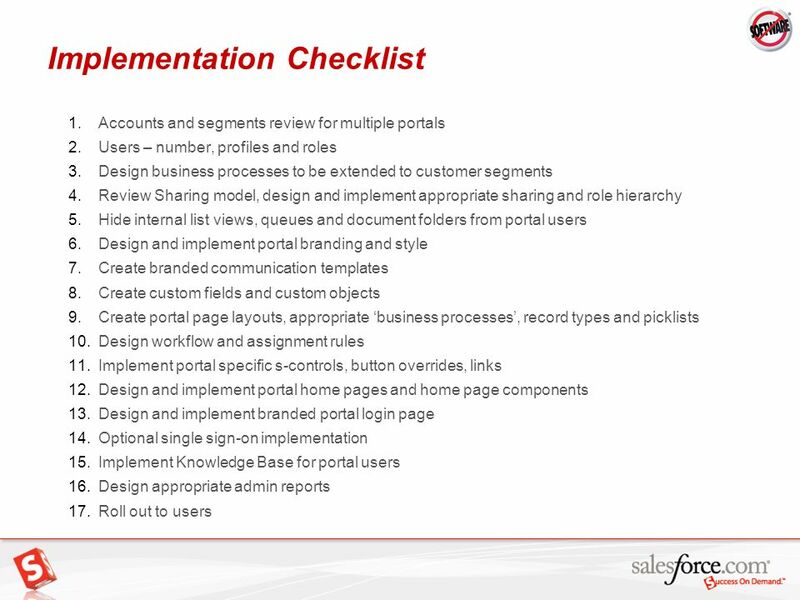 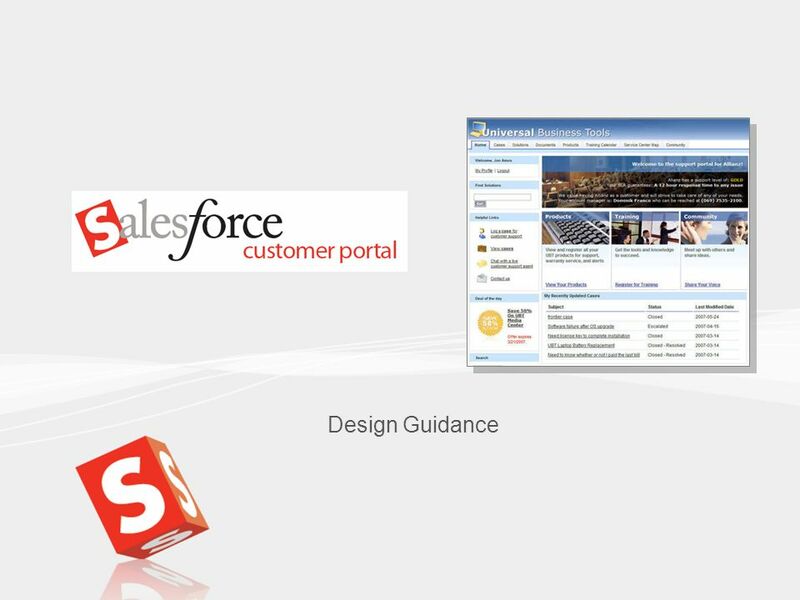 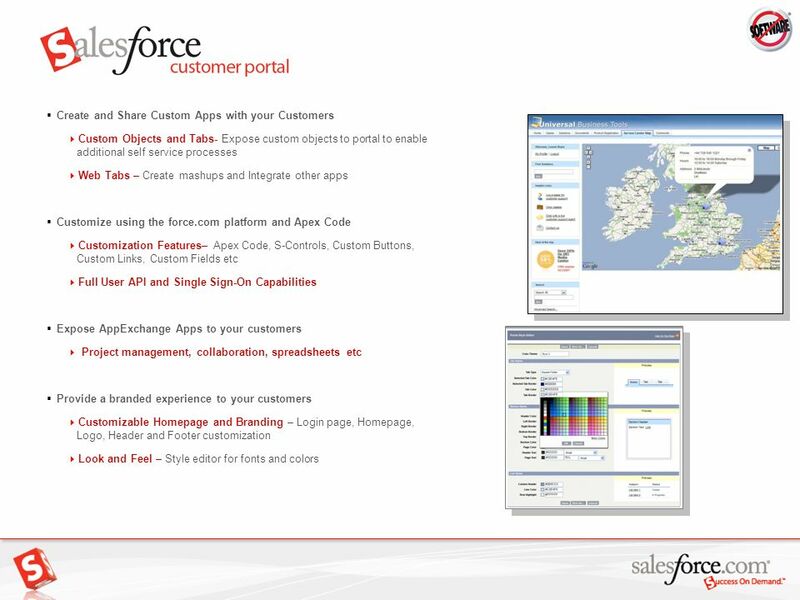 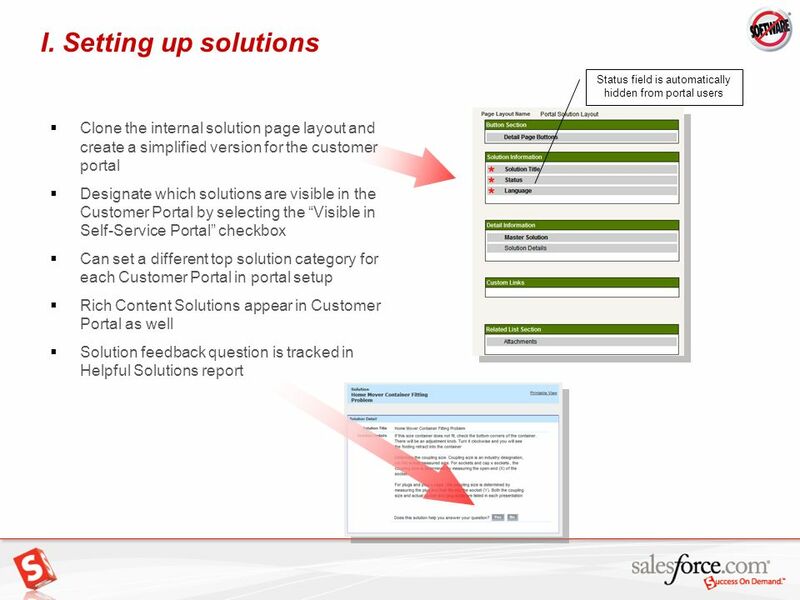 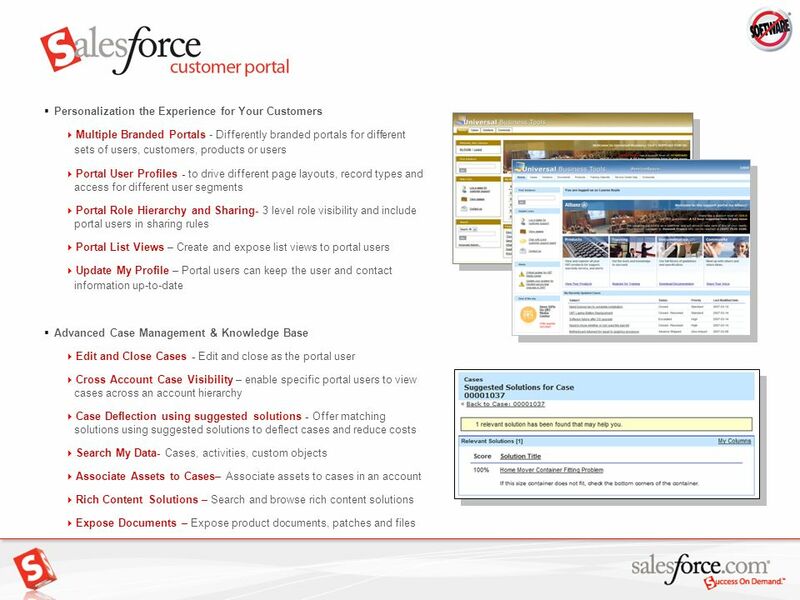 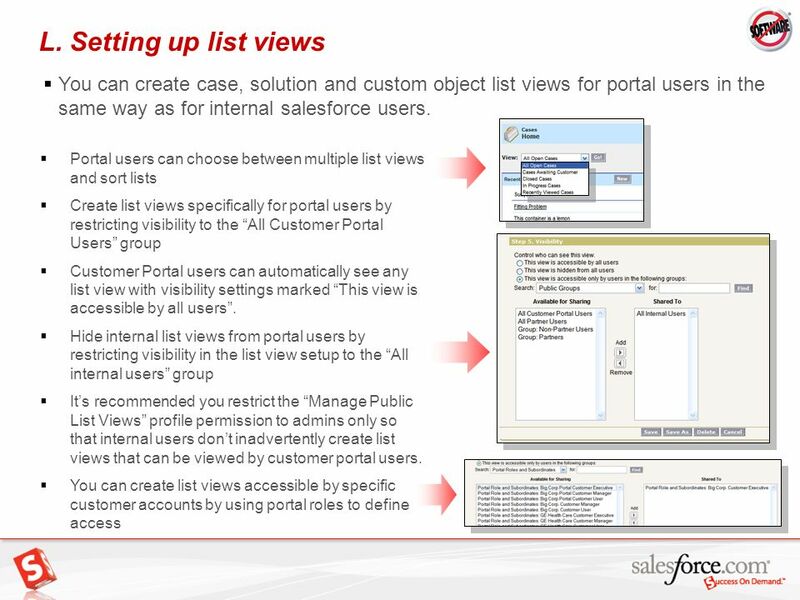 The single sign on capabilities available for the salesforce application are also available for the customer portal. 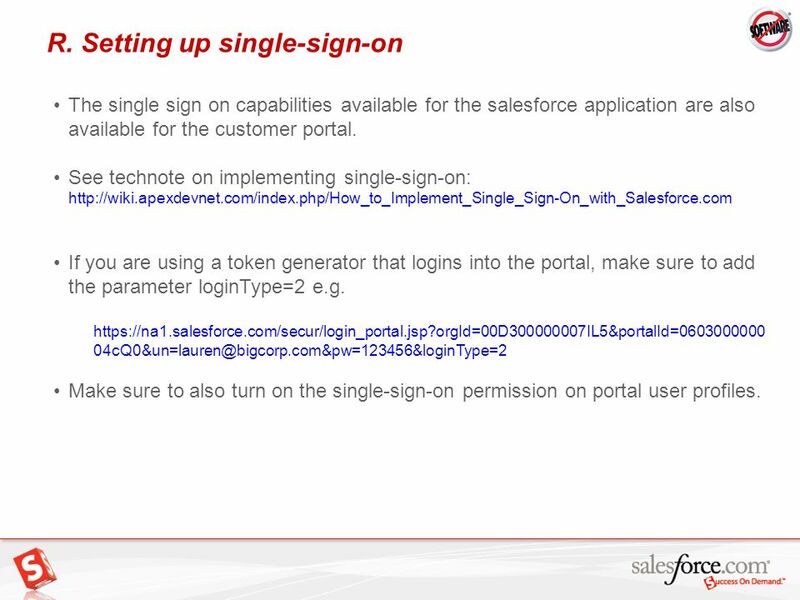 See technote on implementing single-sign-on: If you are using a token generator that logins into the portal, make sure to add the parameter loginType=2 e.g. 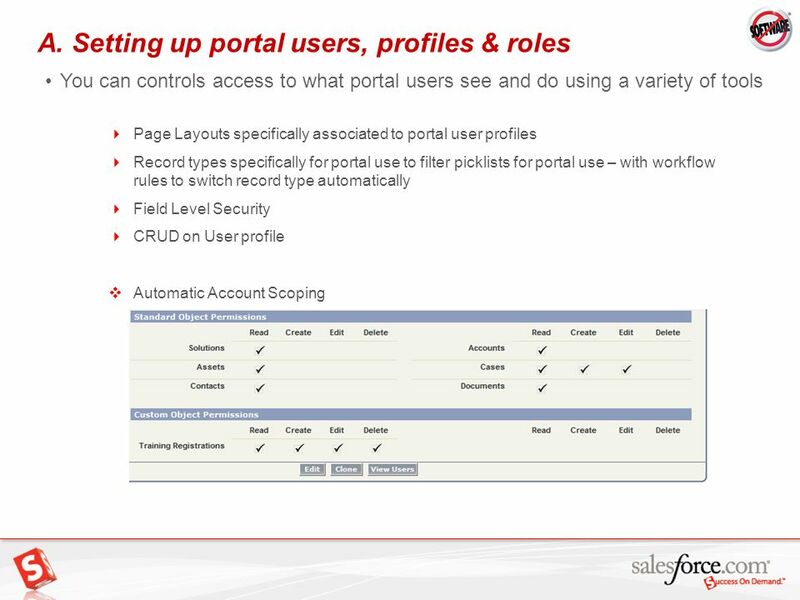 Make sure to also turn on the single-sign-on permission on portal user profiles. 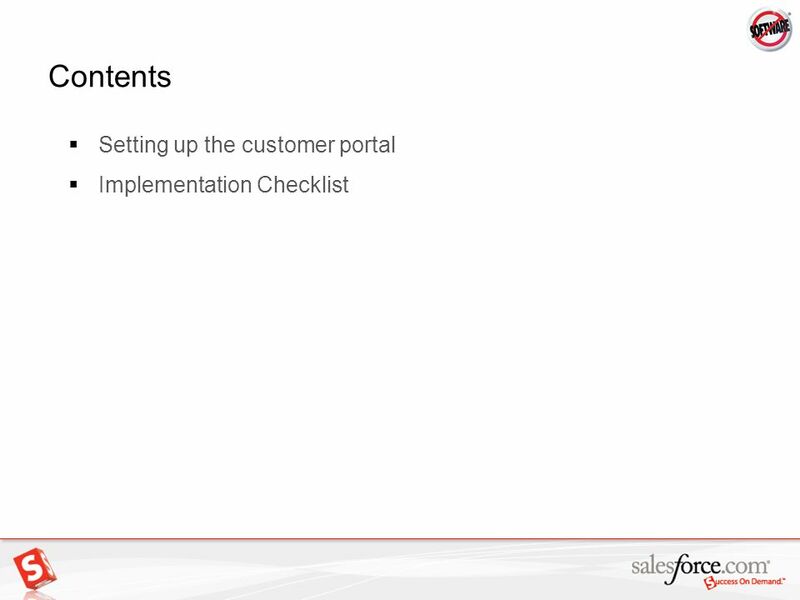 © Tally Solutions Pvt. 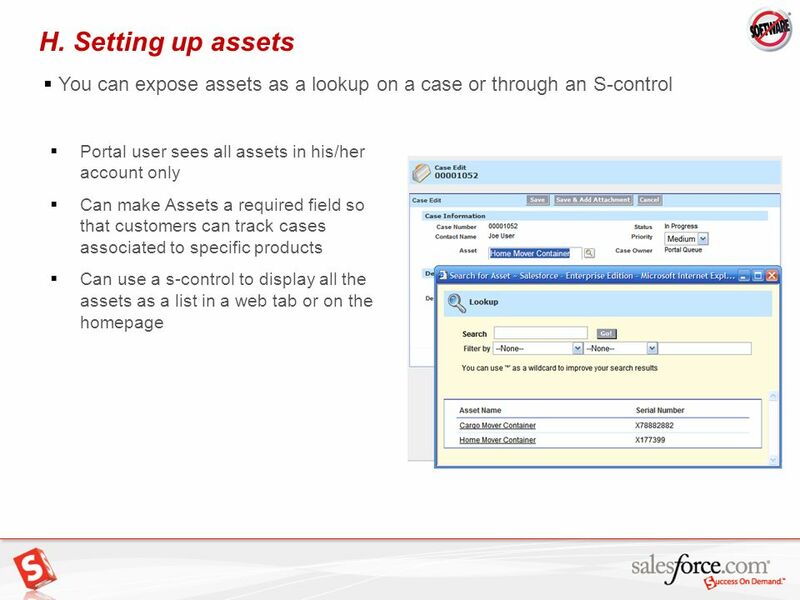 Ltd. All Rights Reserved 1 Control Centre December 09.